Les remorques fermées à Hutchinson, KS sont légères, aérodynamiques et conçues pour offrir une plus faible consommation de carburant, facilitant le remorquage. Chaque année, des millions de familles utilisent nos remorques carrossées pour déménager. U-Haul offre une vaste sélection de remorques carrossées à louer dans la même ville ou pour un aller simple. Consultez les tailles de nos remorques fermées et réservez en ligne une location de remorque chez Budget Storage LLC! Les remorques ouvertes sont idéales pour le remorquage de charges grosses ou surdimensionnées à Hutchinson KS 67501. De nombreuses remorques ouvertes sont louées avec une rampe de chargement pour plus de commodité. La sélection de remorques ouvertes offertes chez Budget Storage LLC représente une solution abordable pour des projets d’amélioration résidentielle, la livraison de meubles ou le remorquage de véhicules récréatifs. La location de remorque ouverte est également populaire auprès des entreprises pour la livraison et lors de salons commerciaux. Les remorques ouvertes sont offertes en une variété de dimensions et de styles afin que toutes les voitures puissent les remorquer. Absolutely NO customer service contact, just had to drop off the U-Haul then almost a week later I get an email that they need to speak with me. I call them and they can't find the U-Haul. It did get worked out, but it was a stressful experience. 24/7 check in is great! Excellent service clean uhaul. Will never use another company for uhaul service again. Very satisfied! Zita Hunt was the best. She went ABOVE AND BEYOND to make sure that i had everything i needed, and that the job was done right! She was a big help! I couldn't have asked for better service. Thank you Zita!!! Kylie was incredibly helpful. She's the best location in Hutchinson and was very helpful. I'd highly recommend her business. My experience couldn't have been better. Everyone was very helpful and considerate. The lady working at this location is awesome. She is knowledgeable, friendly, and made sure we were taken care of. Will rent from this location again. I paid $600 for a oneway drop that UHaul charges $300 for. I was taken advantage of and I discussed this with the agent at pickup. Zita helped me very much with the reservation. The thing that was frustrating is that she reserved 24 blankets for me. When I came to pick up the truck she didn't have the blankets and couldn't get them . She tried but they weren't available. I also had to go to a different spot to pick up the trailer that she reserved because she didn't have one . She was able to get him to hold 16 blankets for me which wasn't enough. We were loading that afternoon & leaving the next am. Needless to say we were short several blankets when is not good. The customer service rep. that checked me in and out was extremely helpful and made sure my needs were met. Excellent customer service, I will recommend every chance I get! Only received a statement indicating no additional charges. Still need a copy of the original rental receipt. The lady was great to work with and made renting the truck very easy. 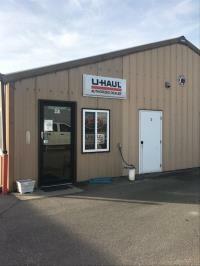 Thank you for making it easy to rent the U-Haul!